AnandTech, known for in-depth reviews of new Apple products, today published a lengthy review of the iPhone XS and XS Max, Apple's newest flagship iPhones. AnandTech's review takes a deep dive into the A12 chip in the two smartphones, which is the first commercially available 7nm silicon. According to AnandTech, the A12 chip features a major revamp of the neural accelerator, a redesigned system cache that features the "biggest change since its introduction in the A7," significant changes to the CPU core, and memory compression for the GPU, all of which has led to impressive performance improvements. Based on SPECint2006 benchmarking, the A12 performed an average of 24 percent better than the A11 in the previous-generation devices. When it comes to power efficiency, the A12 improved by 12 percent, but with memory heavy workloads, power consumption was up, for an average power usage of ~3.36W on the A11 to 3.64W on the A12. SPECfp benchmarking saw average performance gains of 28 percent, and again, workloads with major improvements also resulted in increased power consumption. AnandTech's benchmarking tests suggest that the A12's Vortex cores and architectural improvements offer a "much higher performance advantage than Apple's marketing materials promote." Apple's A12 beat the best Android SoCs both in performance and power efficiency. The contrast to the best Android SoCs have to offer is extremely stark - both in terms of performance as well as in power efficiency. 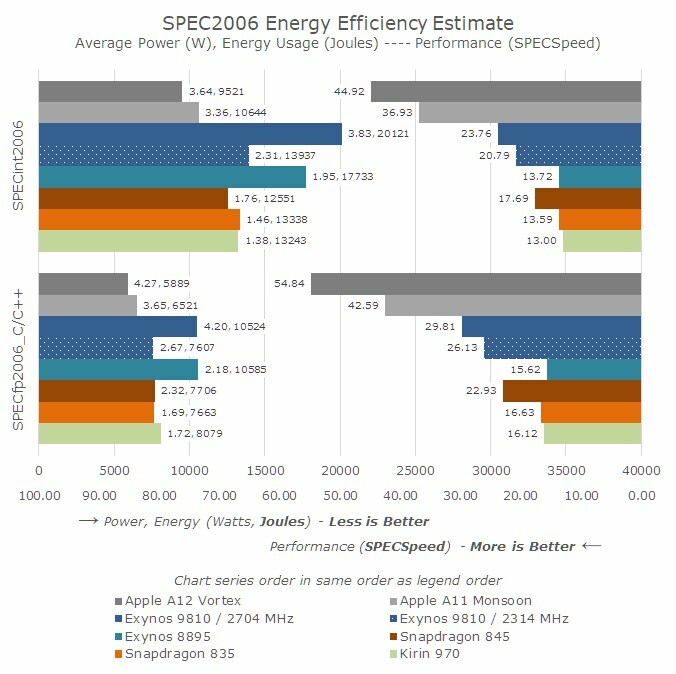 Apple's SoCs have better energy efficiency than all recent Android SoCs while having a nearly 2x performance advantage. I wouldn't be surprised that if we were to normalise for energy used, Apple would have a 3x performance efficiency lead. 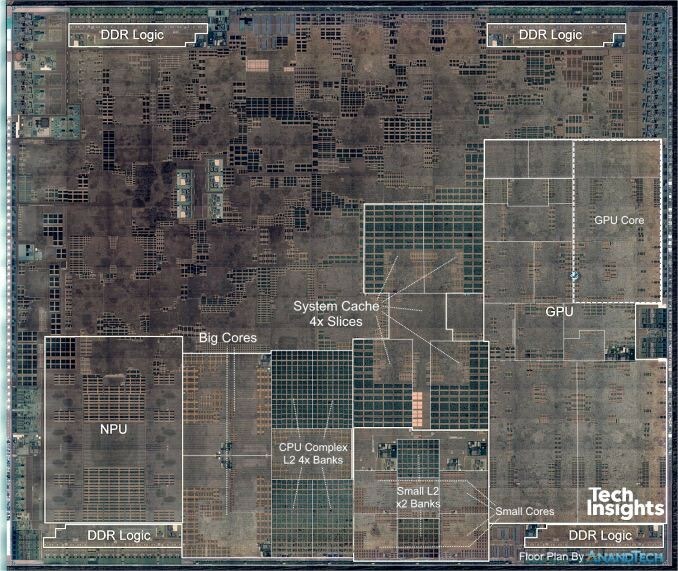 AnandTech says that it's "quite astonishing" how close the A12 and the previous-generation A11 are to desktop CPUs, with "very small margins until Apple’s mobile SoCs outperform the fastest desktop CPUs in terms of ST performance." 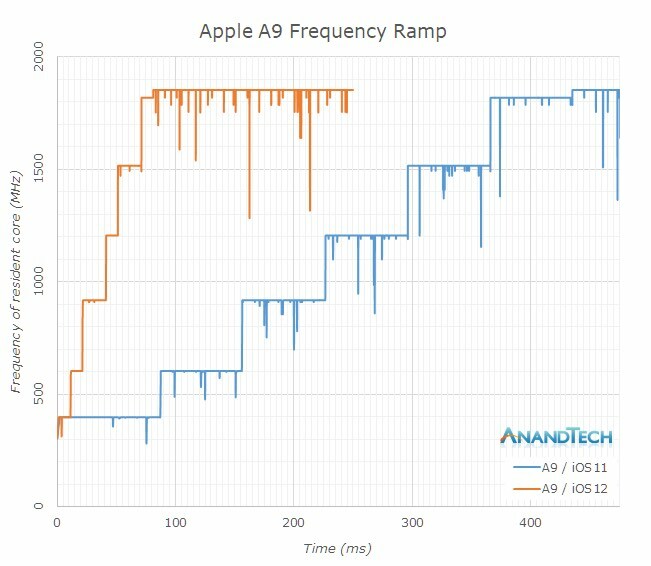 As part of the review, AnandTech also offered a look at how Apple has improved performance in older devices by tweaking scaling performance. The A9 in the iPhone 6s, for example, took 435ms for the CPU to reach maximum frequency, but that time was cut to 80ms in iOS 12 for a "great boost to performance in shorter interactive workloads." Similar improvements were made to the A10 (going from a 400ms ramp up time to 210ms), but there was little change to the A11. All in all, AnandTech said the iPhone XS and XS Max are a "big shift" for Apple's lineup with a "beast of an SoC" that's offering performance improvements of up to 40 percent. Apple's marketing department was really underselling the improvements here by just quoting 15% - a lot of workloads will be seeing performance improvements I estimate to be around 40%, with even greater improvements in some corner-cases. Apple's CPU have gotten so performant now, that we're just margins off the best desktop CPUs; it will be interesting to see how the coming years evolve, and what this means for Apple's non-mobile products. The full iPhone XS and XS Max review from AnandTech is well worth checking out for those who would like to get a deeper technical look at the components inside the two new devices. It goes into much greater detail on the CPU and GPU in the iPhone XS and XS Max, while also taking a look at the camera, battery, display, and other components. Their continued progress with these chips might be the most impressive thing Apple has done post-Jobs. It is absolutely incredible, blowing away all competition like this. Apple's iOS processors are technological marvels. I can't wait for Apple to start putting them into Macs. Not surprising to me at all. Apple's chip team has been probably the most innovative part of the company and overall tech industry in recent years. I have no doubt that Apple will be moving to their own chip designs for their desktop and laptops. As someone who uses iOS only for work and personal, I am excited to see what they keep coming up with. This type of power coupled with pretty big software changes in iOS 13, a great platform should get even better. Google and other Android OEM's have to be looking at this in envy considering none of them control of their own fate the way Apple does. Google holds the cards on that end though, should be an interesting 3-5 years. Maybe not underselling the improvements but you know people LOVE to jump all over them if they even slightly overstate a thing. Why risk it. Pure performance has never been a focus of the iPhone. Two A12 processors in the new iPad Pro! I can only dream of what I can do! "One thing to also very much to take into account is the base power consumption of the phones. The iPhone X, XS and XS Max all fluctuate around 480-500 mW when on a black screen, which is around 150mW more than the iPhone 8 LCD models. This might not sound much, but’s it’s an absolutely huge figure when taking into account that it’s an unavoidable power consumption of the phone whenever the screen is on. I do hope Samsung and Apple alike would be able to focus more on optimising this, as like we’re about to see, it will have an impact on battery life." That makes no sense. On OLED black means pixels are totally off. So theyre saying an OLED basically in standby takes 150mW more power than LCD driving all pixels turned on? That sounds very odd. Im surprised the iphone screen takes almost 150mW more power at 200cd/m² than the Galaxy S9+ despite both built by Samsung. Imagine one of these chips in a desktop or laptop that is not limited by the constraints of an iPhone or iPad. Especially with proper cooling, these chips could be absolute beasts. When rumors starting swirling about Apple potentially moving the Mac lineup to the A series of chips, I was pretty skeptical and concerned. But at this point I'm actually excited by the prospect. The biggest issue will be the transition from x86 to the ARM architecture - but Apple has proven to be quite good at those types of transitions. Looks like Apple hasn't focused on OLED power consumption for this generation, which could explain why the XR has such a significantly higher battery rating. Time to invest in TSMC. Once they start making those processors for Mac.. watch out.